STATESVILLE, N.C. (Jan. 31, 2019) – NASCAR Gander Outdoors Truck Series (NGOTS) winner and veteran Timothy Peters will join Niece Motorsports, piloting the No. 44 Chevrolet Silverado for the first three races of the 2019 season. Peters, who is an 11-time winner in the NGOTS will drive the No. 44 Friends of Jaclyn Foundation Chevrolet in the season-opening event at Daytona International Speedway, followed by races at Atlanta Motor Speedway and Las Vegas Motor Speedway. Peters has 10 NGOTS starts at Daytona International Speedway, visiting Victory Lane at the esteemed track in 2010. Additionally, Peters won at Las Vegas Motor Speedway in 2013. In 2018, Peters made five starts, earning one win, two top-five and four top-10 finishes. The veteran racer is no stranger to superspeedway success – he led the final lap in last season’s event at Talladega Superspeedway to capture his 11th NGOTS victory. The No. 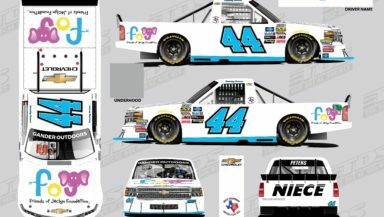 44 Chevrolet will carry the Friends of Jaclyn Foundation colors at Daytona International Speedway. The Friends of Jaclyn Foundation’s mission is to improve the quality of life for children battling pediatric brain tumors and other childhood cancers and to raise awareness through their Adopt-A-Child, Safe on the Sidelines and Guardian Angel Programs. For more information visit friendsofjaclyn.org.